Joel Anderson, chief executive officer of teen retailer Five Below, gets a sugar high at work. "I ate more candy yesterday than I ever had," he said with a huge grin, recalling a recent candy show he attended in Chicago. "But you have to be out there and taste it, and try it. "I tasted some stuff that was absolutely disgusting that the teens love," he said. "It works with their palate." Seizing on what teens and preteens are into and stocking stores with the latest merchandise and selling it more cheaply than competitors in a colorful setting have made Five Below the fastest-growing retailer in its category in the country, according to eMarketer, a retail industry tracker. The brand added 62 stores last year and will add 70 this year, including a flagship store in Center City, to push its total to 436. And, like Pac-Man, it's hungry for more. Under Anderson, Five Below is aiming for 2,000 stores in the U.S. by tapping deeper into the 60 million Americans ages 5 to 19. Sales last year totaled $680 million, up 27 percent from 2013. Still, not all has been fun and games at Five Below. In December 2014, Anderson was named CEO. The company's two founders, Tom Vellios and David Schlessinger, stayed on as active board members. A shareholders' lawsuit was filed in January against the company and certain executives, alleging securities violations. The company said the allegations were without merit. The lawsuit was dismissed last week. Credit Suisse analysts recently praised Five Below as a strong growth vehicle, but said that some store margins were getting smaller and that this constituted a reason to be cautious in buying the stock. As its name implies, Five Below sells everything for $5 or less. Among its best sellers is "Bean Boozled," a board game that sells for $5 in which players spin a wheel, and depending on where the arrow lands, get to eat a normally flavored jelly bean, or one that tastes like "stinky socks" or even a "booger." "Kids love it," Anderson said. "We can't keep it in stock fast enough." A big driver is technology. Five Below offers a plethora of phone and iPhone cases, earphones, and other accessories. "Kids change out their [phone] cases like apparel, like their socks," said Anderson, 50, of Philadelphia, a father of four children ages 12 to 18. Five Below has 13 stores in this area. Its flagship at 15th and Chestnut Streets - expected to open in late August - will be the chain's first two-level store, and, at 12,000 square feet, will be nearly double the typical size. 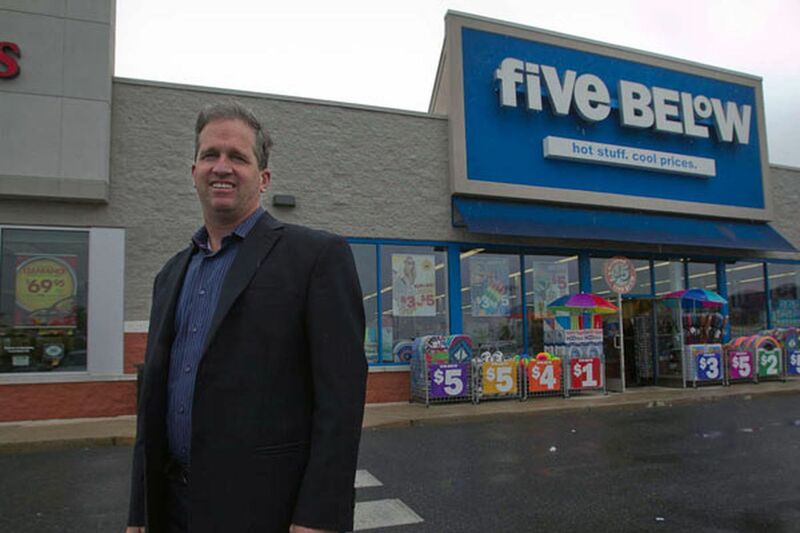 Five Below opened in 2002, hoping to create a store that every kid could afford. Anderson, a former CEO of Walmart.com and marketing vice president at Babies "R" Us, part of Toys "R" Us, said Five Below was meant to embody the best of his former firms. "Toys 'R' Us taught me to be a kid at heart," he said. "Walmart taught me the value of the dollar and the magic of scale. You bring all that together, and that's what Five Below is meant to be." The first thing that hits shoppers is the shock of colors. There are remote control cars, yoga pants, nail polish, baseball and soccer balls in wheelbarrows, and candy - lots of it. Anderson said the stores are meant to encourage play. In the South Philadelphia store, he bounced balls with two young customers. Sue Metz, 52, of Falls Township, Bucks County, is a regular at the Five Below in Fairless Hills. "The selection is great," said Metz, who was there Memorial Day weekend with her husband, Dave, 51, and her nephew, Mike Metz, 6, who got $20 to buy what he wanted. He chose a plastic bow-and-arrow set, a boogie board, a hockey stick, a pack of wrestling cards, the Table and Chairs game, and a small stuffed animal for his finger. Sue Metz bought a ball for her dog, and Dave Metz bought a pair of cases for his Android phone. "It's better than the Dollar Store," he said. "It's better quality." Anderson cringes at being compared with dollar stores (Family Dollar, Dollar General, Big Lots) even though Five Below competes with them, as well as with big retailers (WalMart, Target, Kohl's). He said there was a big difference: "This is a store of wants, not needs." As if it were a mini department store, Five Below has products grouped in categories, or "eight worlds" - including Style, Room, and Tech. "Look at the quality of this," Anderson said, showing off a Pilates mat. He said that the chain buys everything in mass quantity, made possible by its growth, and that this enables it to charge less. At the Fairless Hills Five Below, Nicole Beal, 44, of Levittown, an avid shopper, held up a bottle of Coppertone for Kids for $5 for her daughter Lily, 6. She said the same bottle sold for $14.99 at Walgreen's. "You can get a lot of good deals here," Beal said. "It's always changing, especially with the different seasons. In the fall, we come here for back-to-school" shopping.